I started this list back in early March when the trees outside my office were still absurdly naked. I was waiting for winter to relinquish its grip and thinking about blooming trees made me happy. A LOT of time has passed since then and spring has taken center stage in all its glory. Now that Earth Day is finally here, it seems like the perfect time to share some of my favorite titles on trees. 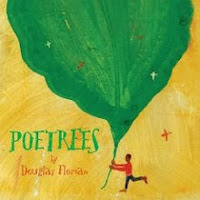 Poetrees, written and illustrated by Douglas Florian - A treerific book of 18 poems about all manner of trees (coconut palm, baobab, paper birch) and tree parts (seeds, leaves, bark). Includes a glossatree. Old Elm Speaks: Tree Poems, written by Kristine O'Connell George and illustrated by Kate Kiesler - This collection of 30 poems captures the beauty of trees in a range of settings and throughout the seasons. Nothing escapes George's notice in this volume, not even the materials of the beaver dam. 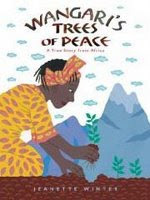 The Tremendous Tree Book, written by Barbara Brenner and May Garelick and illustrated by Fred Brenner - Tree history, tree facts, tree seeds, tree colors, tree treats and many other topics related to trees are covered in this simple introduction, written in rhyme and verse. Tree (EYE KNOW), by DK Publishing - Written for younger readers but appropriate for all elementary grades, this title is PACKED with information and includes gatefold pages, cut outs to peer through, flaps to lift, and eye-catching photographs. 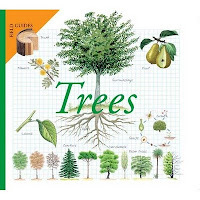 Trees (Field Guides), written and illustrated by Maria Angeles Julivert - Hands-down my favorite reference book on trees, this title has front endpapers on drawing trees and back endpapers on the tools needed to observe trees. In between readers will learn about the distinctive features of trees, from shape, bark, and leaves to flowers and fruits. Are Trees Alive?, written by Debbie S. Miller and illustrated by Stacey Shuett - In the introduction the author explains how this book was inspired by her daughter asking the title question. When Miller answered yes, her daughter then asked "But how do they breathe; they don't have noses?" To answer the title question, Miller looks at the parts of trees and how they function to keep trees alive. The illustrations depict many different tree species. 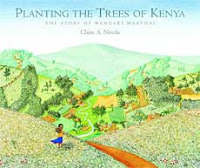 The back matter includes information about the trees pictured in the book. 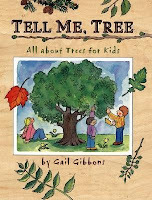 Tell Me, Tree: All About Trees for Kids, written and illustrated by Gail Gibbons - Gibbons has written a fairly neat guidebook to trees. While this volume contains basic information about trees, what they look like inside, their parts, and more, the real interesting piece here is the section on identifying trees. Each tree is identified with a sketch of its overall shape, its leaves, and bark. Seventeen common species are identified. There are also instructions making a tree identification book. Be a Friend to Trees, written by Patricia Lauber and illustrated by Holly Keller - This stage 2 book in the Let's-Read-and-Find-Out Science series explores the role of trees in the environment and the many uses of trees. A Tree is a Plant, written by Clyde Robert Bulla and illustrated by Stacey Shuett - This stage 1 book in the Let's-Read-and-Find-Out Science series looks at how trees grow and change through the seasons. 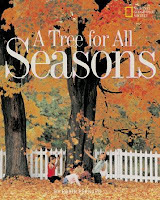 A Tree for All Seasons, written by Robin Bernard - This title from the National Geographic Society has gorgeous photos that document the life of a maple tree through the seasons. Sky Tree: Seeing Science Through Art, written and illustrated by Thomas Locker - Over a series of fourteen paintings, Locker presents the same tree changing with the seasons. The text is short and lyrical. Beneath each section of text is a question about the painting that accompanies it. The back of the book has a section on connecting art and science which addresses the questions posed about each painting from the perspective of both disciplines. A Grand Old Tree, written and illustrated by Mary Newell Depalma - This is terrific book for young readers that tells the life cycle story of a dogwood tree. We see the tree (given a female persona) grow through the seasons and years as she flowers, bears fruit, has many children, and ultimately dies. The simple text and gorgeous illustrations make for a winning combination. 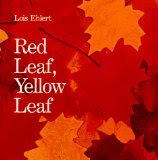 Red Leaf, Yellow Leaf, written and illustrated by Lois Ehlert - In simple text and vibrant illustrations, Ehlert tells the story of a sugar maple and the child who planted it. Winter Trees, written by Carole Gerber and illustrated by Leslie Evans - In this book a child and his dog share a walk through a snowy woods while observing six different species of tree. Each double-page spread contains four lines of simple verse and block prints decorated with watercolor and collage. The book ends with a description of the different characteristics of the trees in winter. Fire! : The Renewal of a Forest, written and illustrated by Celia Godkin - Are all forest fires bad? Godkin's book looks at fire as a natural force that keeps the forest healthy. Fires are often times as essential to forests as rain, releasing the mineral nutrients locked up in old trees. 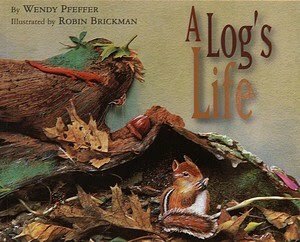 This is an essential book for looking life stages of an ecosystem and how life returns to a forest after a fire. 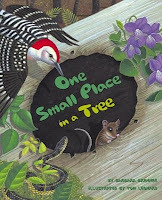 One Small Place in a Tree, written by Barbara Brenner and illustrated by Tom Leonard - What happens to a tree once a bear sharpens her claws on the trunk? Readers find out as they follow the growth of a microhabitat in the tree as the claw marks cut the bark and begin a hole. Over time the space is inhabited by a variety of creatures. The Gift of the Tree, written by Alvin Tresselt and illustrated by Henri Sorensen - This is another story of the life cycle of a tree. This one focuses on an oak tree that has stood in a forest for more than 100 years. It grows weaker over time as it is feasted upon by termites and ants. Fungus enters the heartwood and rot spreads inside the healthy bark. Branches fall during winter storms and finally a hurricane splits the trunk. However, animals still make a home in the fallen trunk. Oak Tree, written and illustrated by Gordon Morrison - This one focuses on an oak tree and its inhabitants. Two levels of text, a story of the life cycle of the tree and short informational bits describing the parts of the tree and the animals living in it, make this one a splendid introduction to trees as habitats. Tree of Life: The World of the African Baobab, written and illustrated by Barbara Bash - The life story of a baobab is told from the folklore of its planting (upside down by a hyena, which is why its branches look like gnarled roots), through its role as a home for many species in the savannah, to its death and the birth of a new tree. The Sea, the Storm, and the Mangrove Tangle, written and illustrated by Lynne Cherry - When the propagule (seed) of a mangrove falls into the sea and finally comes to rest on the shore of a faraway lagoon, it takes root, sprouts and begins to grow. What follows is the story of that tree's life and the ecosystem that springs up around it. Johnny Appleseed, written and illustrated by Steven Kellogg - The history and legend of Johnny Appleseed are told in this charming tale. The author's note at the end of the book attempts to clarify where history ends and legend begins. Also included is a map of Johnny Appleseed's life-long journey. The Story of Johnny Appleseed, written and illustrated by Aliki - A very simple and kid-friendly text introducing readers to the life and legend of Johnny Appleseed. The Man Who Planted Trees, written by Jean Giono and illustrated by Michael McCurdy - This is the story of Elzéard Bouffier, a man who planted trees after seeing the land was dying for lack of trees. He planted hundreds of thousands of trees and slowly saw the community of humans and animals come back to life around him. Redwoods, written and illustrated by Jason Chin - When a boy finds a book about redwoods and begins to read, he soon finds himself in a redwood forest. I hate to categorize this one as fiction, but the story told through the illustrations is fantasy. The text, however, is informational with tons of facts about redwoods. (Perhaps we could call this faction!) 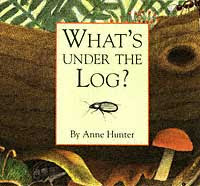 For more information about the book, see the review at Seven Imp and check out the book's web site. 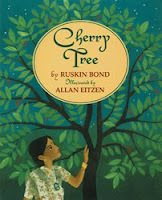 Cherry Tree, written by Ruskin Bond and illustrated by Allan Eitzen - On the way home from the bazaar a young girl eats all of the cherries in her possession. Her grandfather suggests she plant one of the pits. The seed sprouts and after surviving rain, munching animals and other mishaps, the tree blossoms some years later. Aani and the Tree Huggers, written by Jeannine Atkins and illustrated by Venantius J. Pinto - Based on a true story, Aani wraps herself around a when the tree cutters come to her village to take them down. The importance of trees to the environment is not lost in the midst of this powerful story. Someday a Tree, written by Eve Bunting and illustrated by Ronald Himler - When a family discovers the area around their favorite tree has been poisoned, they work with others in the community to try and save it. Despite their efforts, the tree dies. Don't worry though, the ending is hopeful as acorns are planted in healthy soil. The Seasons of Arnold's Apple Tree, written and illustrated by Gail Gibbons - In this story, Arnold and his dog play in and around their apple tree throughout the year. In the spring they build a swing and smell the apple blossoms, in summer they build a tree house, in fall they rake leaves and pick apples, and in winter they build a fort. Once There Was a Tree, written by Natalia Romanova and illustrated by Gennady Spirin - When a woodsman finds a broken tree, he saws it down so that only a stump remains. However, that stump still serves a purpose and is used by ants, a bear, a titmouse, a frog, an earwig and others. Here are a few resources to expand your thinking about trees and the many things they give us. The Arbor Day Foundation has some terrific resources for teaching about trees. Maple Syrup: A Taste of Nature - This full color pdf explains how maple syrup makers create their product and traces each step of production from maple seed to breakfast table. The Sustainable Forestry Teacher Resource Center has a series of lesson plans on forestry and natural resources. The International Paper Company has posters and teacher's guides as well as a booklet on The Life of the Forest. Try these online hidden picture activities where you must find paper products hidden in a forest scene and classroom scene. You can also download print versions for the forest scene (pdf) and the classroom scene. The EarthAnswers page from Paper University answers questions about paper and the environment in a series of downloable pamphlets. Questions include "Are We Running Out of Trees? ", "How is Paper Recycled? ", "What's In a Tree? ", and more. What kind of products come from trees? Take this quiz and find out! Have I missed one of your favorite tree books? If so, let me know so I can add it to the list. Anything but The Giving Tree (sorry, personal bias here!) will be added. Thank you for this extensive and abundant list of where to find tree poetry. Douglas Florian is visiting my Poetry Class at Queens College during the first week of May.